Finished May 2018. Final score: 3 / 5. This book was recommended to me. This is high-diplomacy sci-fi versus the epic space battles like many current sci-fi stories (not that I have anything against one style or another). The crew just encountered a new species (which will be called "Moties"). Rather than raising shields and readying torpedoes, the crew cautiously decides to attempt diplomacy, and starts with good success. The Moties home world, soon to be called "Mote Prime", is near a yellow star that is near a giant red star. Viewed from a distance, the resulting constellation is seen by many as the face of God. The red star is an eye. The sun star is "the mote in God's eye." If a science vessel ever encountered intelligent alien life, the book behaves exactly how I would expect. Most sci-fi stories start with diplomacy just enough to say there was an attempt, and then it is time for torpedoes. For the Moties, ambassadors are exchanged and actual teaching and language lessons begin. If you are a fan of Arrival, you'll appreciate this in-depth culture exchange. A different species has a different culture. The ambassadors try their best to make the humans feel comfortable, and all the effort related to that was interesting. Of course there are military concerns with new intelligent species. Their voices are loud and expected, and their influence is strong. Scientists want one thing, and the military wants another, and you can guess which side wins arguments. A merchant with questionable morals. A new species means new trade opportunities. What is our goal here? Is it just "learn about the Moties?" I felt everything dragged a bit while the culture became increasingly complicated. I could see no overall story arc to keep me going. The ending was a whimper. Stop reading if you don't want to know. I normally do not reveal spoilers, but the first few sentences in the book 2 summary blows it out. The decision was... quarantine and wait 50 years. Really? We are just going to wait-and-see? I walked away very unsatisfied. Perhaps the intent was to set up an explosive clash in book 2. My score for this book was hovering at around 3.5 until then. That dropped it to a 3, and I do not feel the need to proceed further. 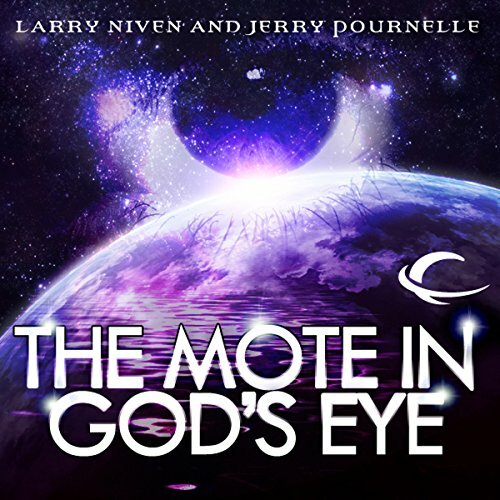 Discuss The Mote in God's Eye in the forums.